NEW YORK—The Maestro. Holder of the Presidential Medal of Freedom, Knight Commander of the Order of the British Empire; and at 88 still remarkably sharp and witty. Nine years after leaving office, he likes to speak his mind. “I don’t think it’s possible,” for the Fed to end quantitative easing without “turmoil,” he said at the Council on Foreign Relations, Oct. 29. Well, the Fed did exactly that on Wednesday and the stock market drawdowns in 2010, 2011 and 2012 after the end of different easing programs support his point. 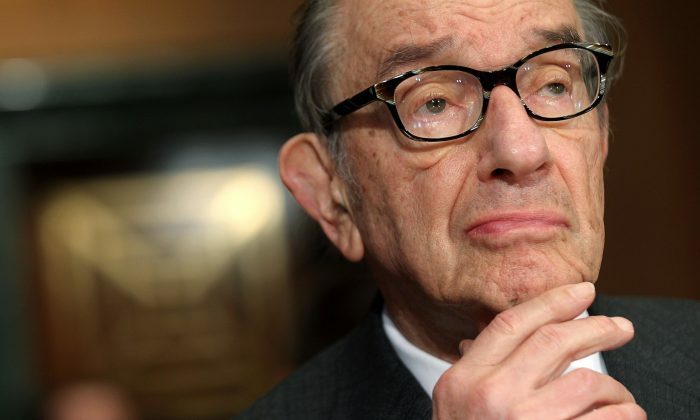 Surprisingly, Greenspan doesn’t sound like a central banker at all anymore. No more of his legendary congressional hearings, where the audience would be happy if they could take away one or two points in a couple of hours. Of course, he doesn’t quite accept responsibility for inflating no less than four speculative bubbles (savings and loans, Asian financial crisis, dotcom and subprime), but he does give us the reason why he never bothered deflating them during his tenure from 1987 to 2005. “Pricking the bubble, short of collapsing the economy, doesn’t do anything,” he said about the last years of his tenure, which ended in 2005 and left Ben Bernanke to deal with the mess of the subprime crisis. However, he outright slams economic models and forecasting (“what is it good for”), two things the central bankers du jour and even Greenspan in his days were rather fond of. “The only place where incremental tightening actually defuses bubbles is in econometric models and that’s because they are misclassified,” he says today. He thinks the financial system is full of “animal spirits” and excess speculation, that banks should put up more capital and actually absorb the losses they create. This is ironic, as he was a major force driving the repeal of the 1933 Glass-Steagall Act at the end of the 1990s, which had barred investment banks from speculating with depositors’ money. Unlike his central banker colleague Mario Draghi, Greenspan also thinks the euro was a bad idea and will most likely break up as debtor nations should have the option to solve their debt problems through devaluation. Last but not least, he is rekindling his preference for a gold standard, which he supported before becoming Fed chair. Unlike his successor Ben Bernanke, Greenspan understands gold intrinsic properties as a store of value and a medium of exchange and correctly thinks of it as money. His recommendation in times of crisis and turmoil: buy. Watch the video: Alan Greenspan discusses current trends in the global economy and his solutions for addressing the financial crisis.